Did he regret the gruesome killing, he was asked by reporters at the police station where he was being taken in a mask. "He threatened to kill my family and me. He gave me an ultimatum, if not him, it would be me," he said, before being led away. Jaipur: He hacked a man to death with a pickaxe and then burnt his body in Rajsamand in Rajasthan, filmed on mobile by his teen nephew. 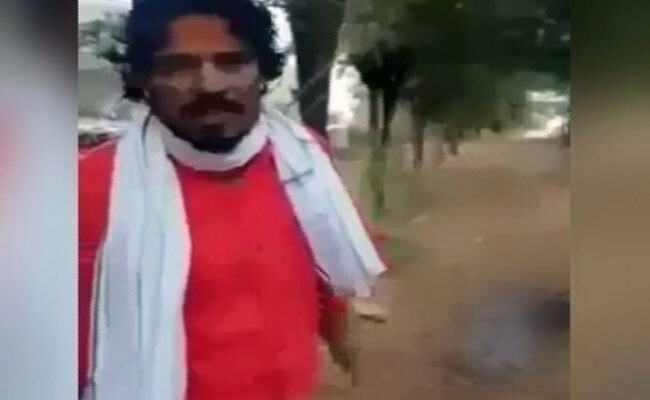 Justifying the murder on camera that has generated waves of shock and horror, 33-year-old Shambhu Lal Raigar today said he did it because he was "threatened". Shambhu Lal was unemployed, say the police. He claimed he had brought back a woman who had eloped with a man and gone to Bengal. On the video of the barbaric killing, which went viral after Shambhu Lal shared it on WhatsApp, he warns against "Love Jihad" - the term used by rightwing hardliners who accuse Muslims of marrying Hindu women to convert them. Asked about his victim, 45-year-old Mohammad Afrajul, Shambhu Lal told reporters: "He ran away with a girl from our neighbourhood...I knew the girl from childhood. I studied with her brother." But the police say Afrajul, a daily wager from Bengal, had nothing to do with the case that the killer refers to. Afrajul was sipping tea with his brother at a roadside shop when Shambhu Lal allegedly stopped and asked for directions. On the video, he is seen walking with Shambhu Lal willingly, and then crying out in shock and fear at being struck by the pickaxe. His screams die down after repeated blows. Shambhu looks into the camera and launches into a vile communal rant, shouting warnings against "Love Jihad" and saying; "If I have to die, I will kill some and die." The police say their inquiries reveal that Shambhu Lal, a father of three, was obsessed with watching hate videos on his phone and was part of rabid groups. He lives in a tiny colony in Rajsamand town, in a joint family. His parents work in Anand in Gujarat. His oldest daughter is 16. The youngest, 13, is seen in one of the hate videos he filmed and circulated. He was reportedly in a financial mess. He was earlier involved in the marble trade but had not done any business for the past year, according to the police.